7 1/2 by 9 3/4 in. 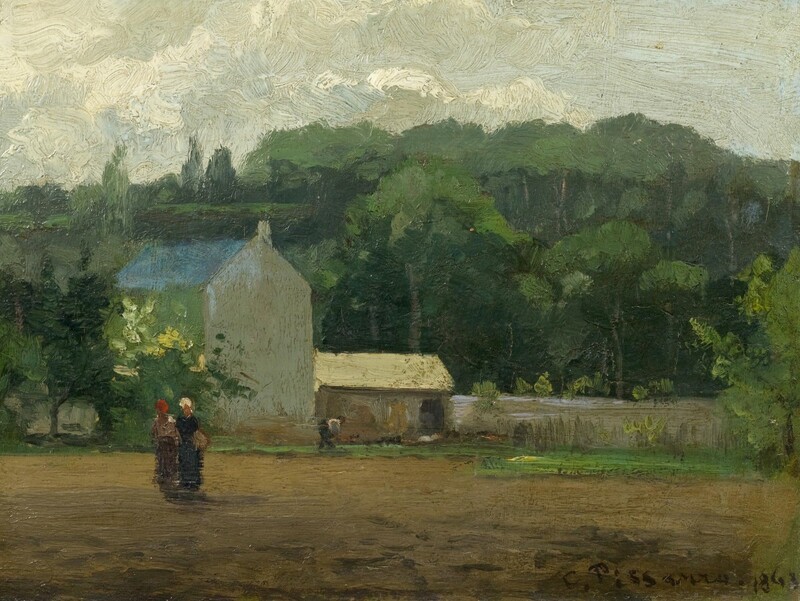 It is no accident that Pissarro’s 1863 depiction of a farmstead in the French countryside immediately recalls the work of Corot. The simple, almost block-like structure of the buildings, the wide range of overlapping shades of green in the background, which define and delineate the trees, together with the figures, identifiable only through quick dabs of paint were all trademarks of the older master’s technique. As a young artist, enrolled at the École des Beaux Arts, Pissarro sought out Corot for instruction and Corot’s advice was to paint small sketches, study light and the tonal variations in color. In fact, in the catalogues for the 1864 and 1865 Salons, Pissarro calls himself a student of Corot. Pissarro spent the summer of 1863 at La Varenne-Saint-Hilaire on the Marne, not far from Paris and this is the setting of our painting. 1863 was a watershed year, not only for Pissarro but for the evolution and direction that art would take going forward. For Pissarro, it was a happy time as his son, Lucien was born in February. The official Salon of 1863 saw entries as varied as Cabanel’s Birth of Venus to Millet’s controversial Man with a Hoe. While Pissarro had been an exhibitor in prior Salons, he had met with sporadic success and therefore sought out alternate venues, agreeing to include three paintings in the famous 1863 Salon des Refusés, which also featured Manet’s Déjeuner sur l’herbe and entries by Cézanne. Pissarro would go on to exhibit on all eight of the landmark Impressionist exhibitions from 1874-1886 and at the end of his career he became affiliated with the work of the Neo-Impressionists and Georges Seurat. However, it is in the early plein air studies from the early 1860s, rarely seen because of the consequences of war, that we glimpse the origins of what would become his most beautiful landscape paintings of the late 1860s.